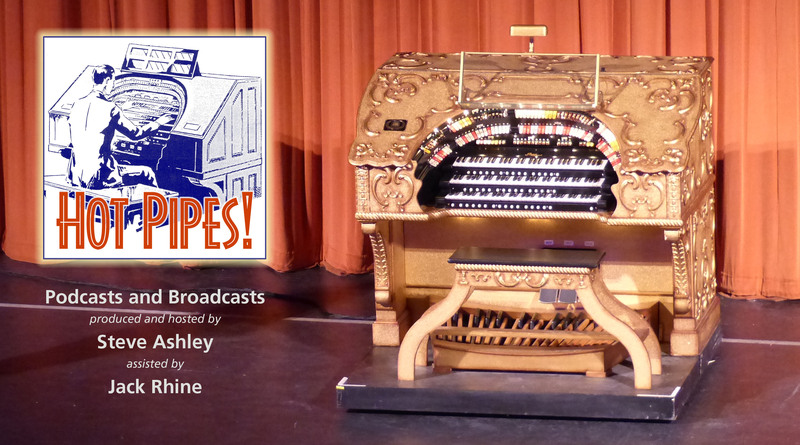 Hot Pipes Podcasts & Broadcasts | For the very best in theatre pipe entertainment from around the world! Hosted by Steve Ashley, assisted by Jack Rhine. All the half-hour and one-hour shows are available in mp3 /192 kbps and m4a/320kbps formats. The m4a versions are, of course, of much higher fidelity than the mp3: which version you choose depends on the device on which you listen and how much Internet bandwidth you have available. Since the mp3 files are smaller, they would be more suitable for streaming online and/or listening via inexpensive speakers. If you have good equipment, chances are you’ll notice the difference with the m4a versions. All Apple Macs and PCs running newer versions of Windows should be able to decode the m4a files. The shows are now split into their categories to make it easier to listen to and/or download the programmes of your choice. Click on the link(s) below to go to the show pages. 1. More shows are currently being archived to release space on the server: One Hour Podcasts 100-124 and Half-Hour Broadcast shows 51-74. At the suggestion of some listeners, I have reinstated the playlists for previously archived shows and added a link to the Dropbox archive on each playlist. Playlists will no longer be deleted – just the sound files. 2. The show links above are being changed to list the podcasts and broadcasts without all the “superfluous” text that currently makes navigation more difficult. You will now see a complete list of shows and their themes. 21 February, 2019: Additions to the Hot Pipes library have just taken the total track count over 60,000, of which over 42,000 are theatre pipe, with the remainder mostly electronic. Many thanks to all who have helped to make this possible! 4 December, 2018: Please consider donating to the Boardwalk Hall Organ CD project. The restoration team have been working flat out for some years to bring this behemoth back to full working order after decades of neglect. The team is now on the home stretch and it now needs another $4,000 of the £12,000 needed for the CD production. The Donation Form can be found here. 30 October, 2018: Added a list of the last 10 shows (that’s about one month’s) to the right of this page. 20 October, 2018: Half-hour shows 1 to 50 and 1-hour shows 55 to 99 have now been deleted from this website. If you wish to download and/or find playlists of those programmes, please go to the Archive page.